Satyajit Ray's Apu Trilogy films are considered by many to be the crowning achievement not just of Satyajit Ray himself, but of all of Indian film. 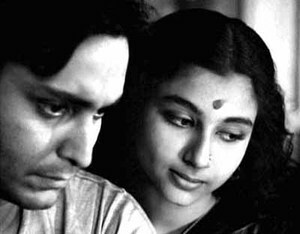 Apur Sansar (The world of Apu) is the final installment of the story, and I saw it without having seen the first two chapters, which recount events in Apu's childhood and adolescence. Apur Sansar picks up at Apu's graduation from school. Living in a grungy Calcutta tenement beside the railroad tracks and barely scraping his rent together, Apu (Soumitra Chatterjee) aspires to be a great novelist, and we learn early on that he has had some success at it, selling a short story to a local periodical. On a vacation with his practical and grounded friend Kulu - ostensibly for Kulu's cousin's wedding - Apu makes a rash and heroic decision that changes his life forever. The bridegroom succumbs to mental illness, and Kulu prevails on Apu to take his place and marry Kulu's cousin Aparna (Sharmila Tagore, here only about fourteen years old). Apu and Aparna settle into a spare life in Apu's dingy flat, and for a while they enjoy a delicious period of newlywed bliss. Then tragedy strikes, though, and Apu, unmoored and confused, struggles to recover his bearings. Apur Sansar's story covers a period of six or seven years in Apu's life, and is therefore necessarily episodic in nature. Indeed, the film may fairly be characterized as a series of beautifully shot, poignant moments. The dialogue is sparse and one is left to fill in the blanks, to guess at what the characters are thinking and feeling. But the direction and performances are both subtle and expressive, so the emotional content is very real, even if the viewer must supply it. In one early scene, Apu visits a pharmaceutical factory looking for work. His face droops in self-doubt as he realizes that he lacks the constitution for monotonous physical labor. Later, a series of warm, tender scenes conveys the quiet happiness of Apu and Aparna's married life. In every scene, emotions play subtly across the actors' faces and evocative symbols - a wounded animal, a torn curtain, an inkblot - do much of the film's heavy lifting. I feel somewhat out of my league reviewing Apur Sansar, which, despite the many ways in which it is fundamentally an Indian story, reads more like a European art film than an Indian film. I don't know a thing about European art films, and while I enjoyed Apur Sansar and was moved by it, I don't know that I fully understood or appreciated it. Each shot is loaded with complex symbolism that is rich and even apparently contradictory at times. At the movie's conclusion I immediately wished I could watch it again to give more thought to those symbols. Instead, here I am with my rather impressionistic and incoherent commentary. For something more, please visit my friend Amit and read his thoughts.